The airline industry is an exciting area for investors today, but airlines use a lot of jargon to describe their results. Here are seven key terms you should know. Airlines came back into fashion as investments during 2013. All of the major airlines, including Delta Air Lines (NYSE:DAL), United Continental (NASDAQ:UAL), Southwest Airlines (NYSE:LUV), and US Airways -- now a part of American Airlines (NASDAQ:AAL) -- achieved gains of at least 50% last year. 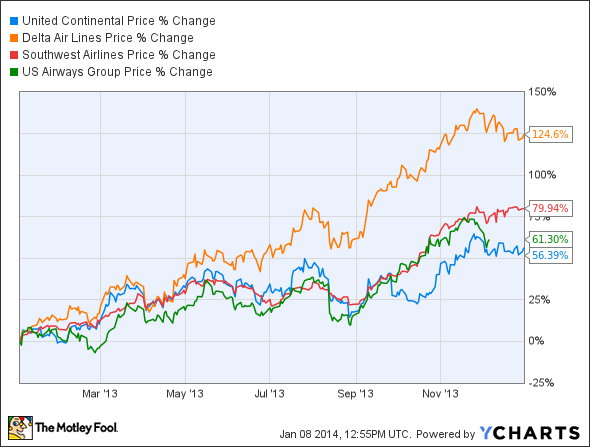 2013 Airline Stock Performances, data by YCharts. Several airlines remain potentially compelling investments in 2014. However, if you're thinking about investing in the airline industry, you need to know the lingo. Airlines use a variety of industry-specific terms to describe their performance. Here are a few key terms that will help you better understand how the airlines are doing. The available seat mile, or ASM, is the preferred measure of capacity in the airline industry. This figure is calculated by multiplying the number of seats on each plane by the number of miles that plane flies during a particular period of time (such as a month or a quarter) and adding up the results. Thus, an airline with a single plane of 150 seats that flies 5,000 miles per day is generating 750,000 ASMs each day. There are other capacity measures out there, such as the number of flights or the total number of seats on each flight, but neither is as useful for comparative purposes as ASMs. For example, counting the total number of flights does not differentiate between a 50-seat plane and a 500-seat plane, and counting the number of seats on each flight treats a 500-mile flight the same as a 5,000-mile flight. By contrast, using ASMs as a measure of capacity allows you to compare airlines that may have different average aircraft sizes or different average route distances. ASM statistics are also very useful for adjusting revenue and cost statistics to account for changes in capacity. The revenue passenger mile, or RPM, is a statistic that measures airline traffic. It represents the total number of miles traveled by all paying passengers in a given time period. RPMs thus measures not only how many passengers an airline carries, but also how far they travel. Load factor represents the percentage of seats filled by paying passengers in a given time period. It can be easily calculated by dividing traffic (the number of RPMs for that time period) by capacity (the number of ASMs for the period). Higher load factors are generally desirable, since the marginal cost of putting another passenger on a flight is minimal compared to the fixed cost of operating the flight. Unit revenue is a general term used to describe revenue statistics that are adjusted for the amount of flying an airline does. The most common unit revenue statistic is passenger revenue per available seat mile, or PRASM. This is calculated by dividing an airline's revenue from ticket sales by the number of ASMs it flew in a particular period. Higher PRASM is better, all things being equal, as it means that the airline is squeezing more revenue from each unit of capacity. A closely related measure is yield. This represents the total of airfare charges for a given flight or set of flights, divided by the number of RPMs (i.e., traffic) for those flights. In other words, it adjusts the average airfare for the distance traveled. Lastly, revenue per available seat mile, or RASM, is similar to PRASM, but it includes all sources of revenue. This is especially important for ultra-low-cost carriers like Allegiant Travel (NASDAQ:ALGT), which tend to rely on non-ticket (or ancillary) revenue to drive earnings. For example, in Q3, ancillary revenue represented around 34% of Allegiant's total revenue. Ancillary revenue is becoming more and more important for airlines of all types, so RASM is becoming an increasingly important statistic. On the other side of the ledger, airlines calculate unit cost figures by dividing cost figures by capacity. In its simplest form, cost per available seat mile, or CASM, represents an airline's total operating costs for a particular period of time divided by the number of ASMs it flew in that period. However, many airlines prefer to report a measure of unit cost that excludes certain expenses that are either unusual in nature or otherwise outside of the company's control. Most commonly, airlines will report "CASM ex-fuel", a unit cost measure that removes fuel expense. Many airlines also exclude profit sharing, special items like restructuring charges, and expenses related to non-core businesses (e.g., performing maintenance work for other airlines). These statistics can be useful in terms of understanding an airline's core cost performance. However, investors should remember that other costs are just as real; it's important to keep an eye on all of an airline's cost drivers to assess profitability prospects. Understanding the terms highlighted above will give you a big head start for evaluating airlines' performance. Ultimately, all investors are interested in profit, but the interplay between capacity, unit revenue, and unit cost -- among other factors -- is critical for getting there in the airline industry.